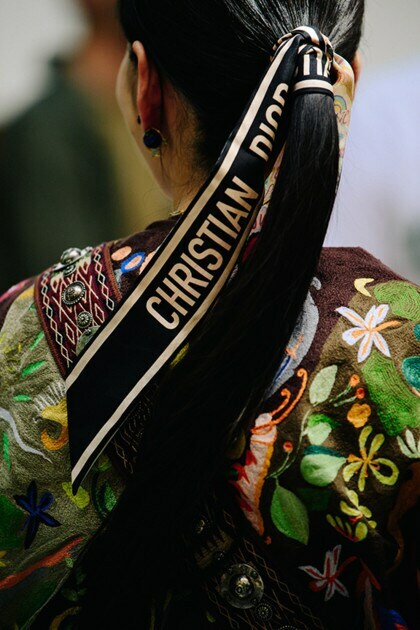 In his autobiography, Dior by Dior, Christian Dior reasons that there are two Diors: the man and the myth. 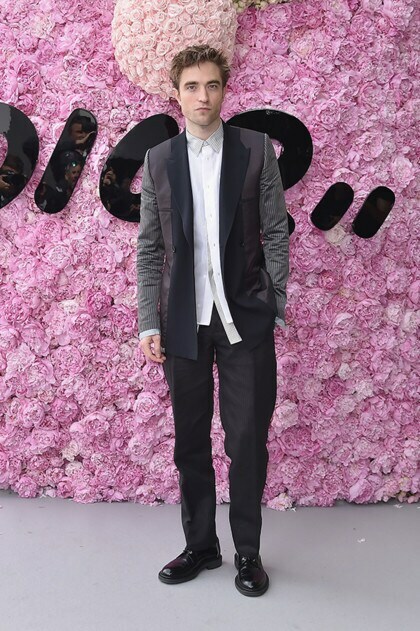 The latter refers to the house of Christian Dior, born in 1947; the former, Monsieur Dior himself. 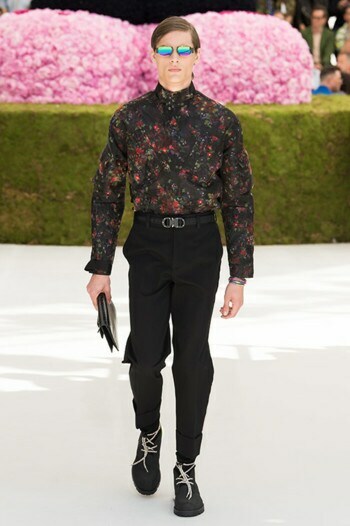 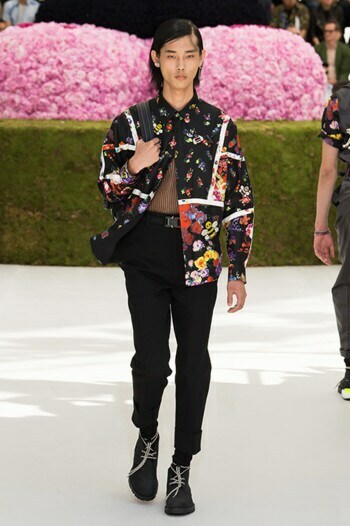 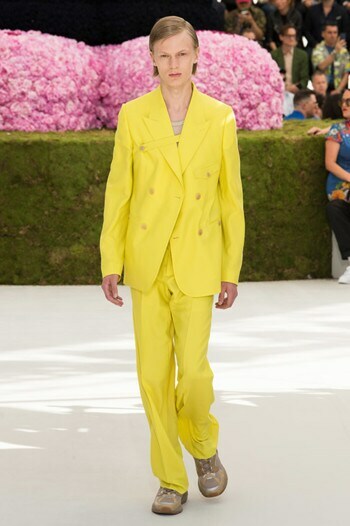 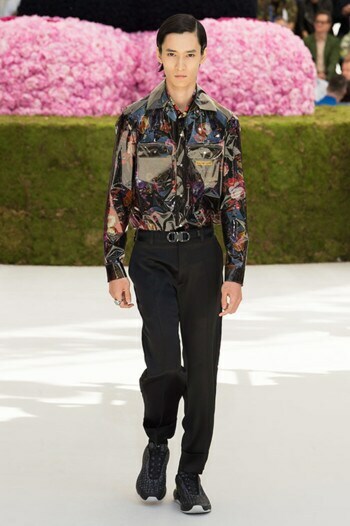 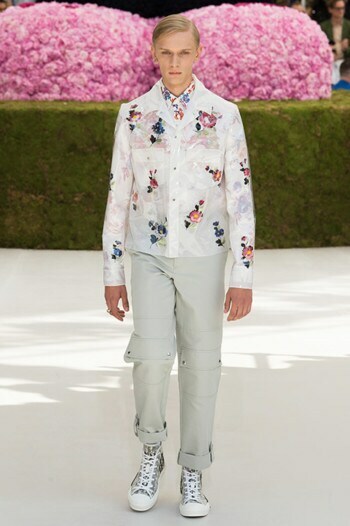 For his debut collection as Artistic Director of Dior Men, Kim Jones pays homage to both fantasy and reality by infusing couture codes outlined by Monsieur Dior into menswear. 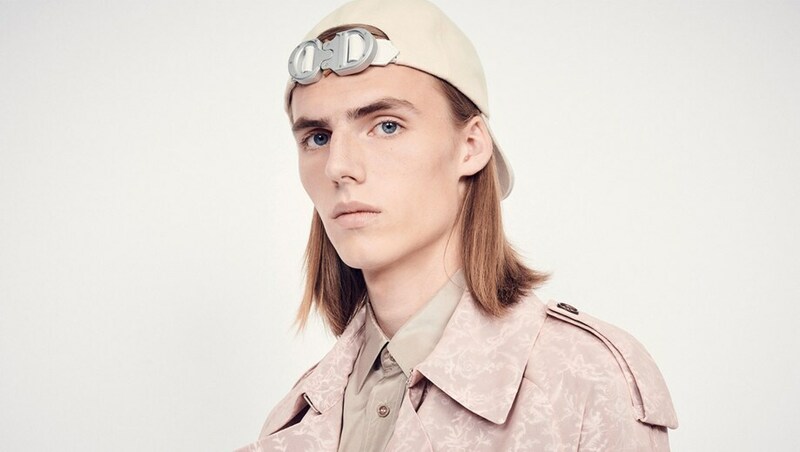 Drawing inspiration from both Christian Dior’s private life and his creative output, the collection represents a dialogue between two sides of his personality. 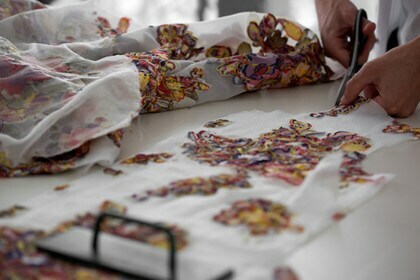 Couture informs the choice of materials—notably the use of a toile de Jouy that mimics the walls of Dior’s first boutique at 30 Avenue Montaigne. 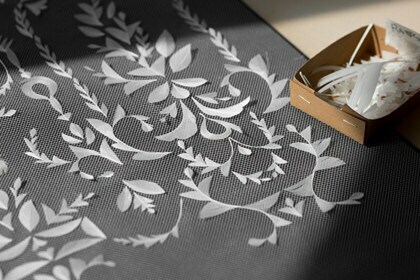 A new Dior emblem, inspired by the house’s heritage, is executed in feathers and also appears as jacquards and embroideries on materials as diverse as tulle and soft leather. 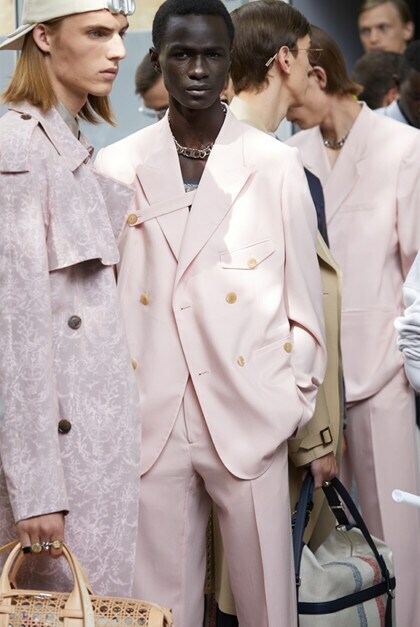 Translating a quintessentially feminine couture identity into a masculine idiom results in softer silhouettes with rounded shoulders and eased shapes. 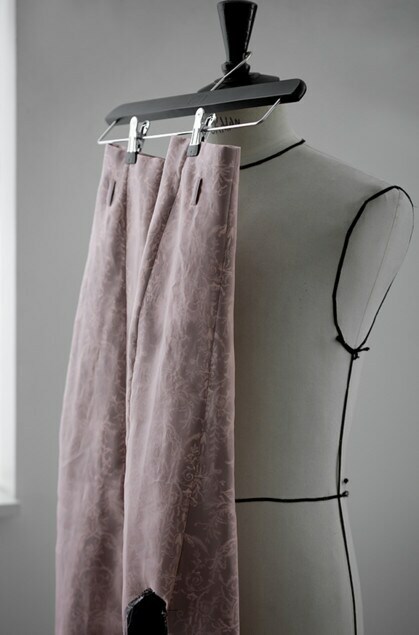 A slashed cowl added to the back of shirts exposes the sensual nape of the neck. 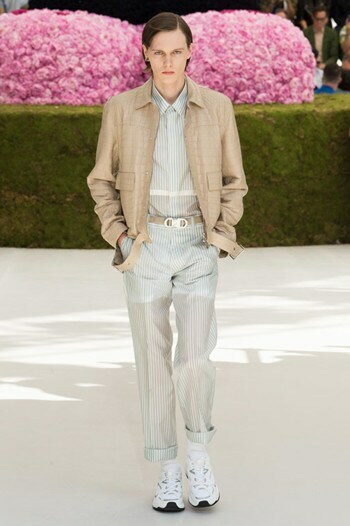 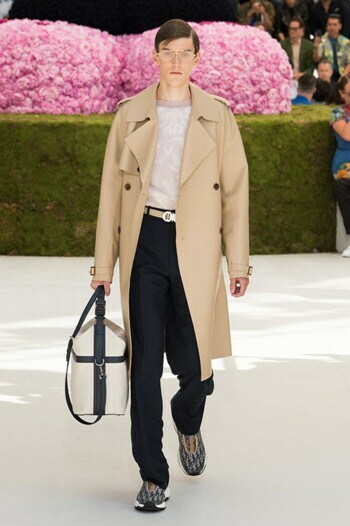 A new Dior jacket, the Tailleur Oblique (done in featherweight cashmere, summer mohair, and Monsieur Dior’s beloved British wool), wraps the body in a diagonal line and serves as a subtle reference to the shape of Dior’s Autumn-Winter 1950 collection. 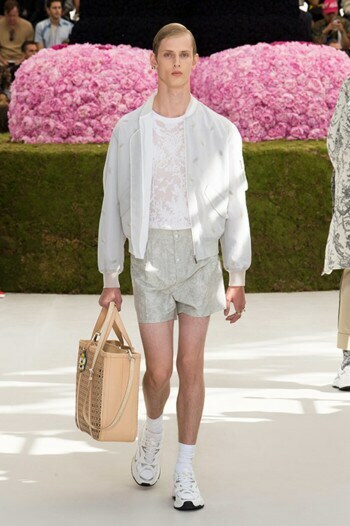 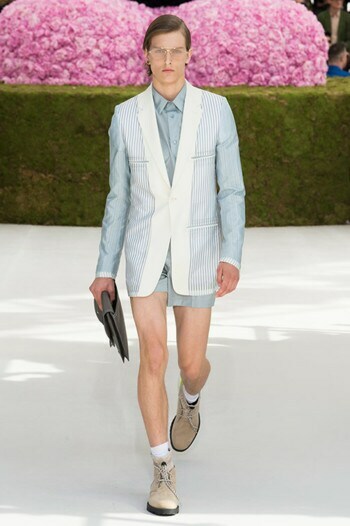 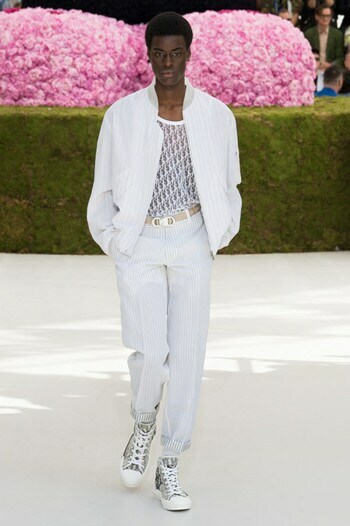 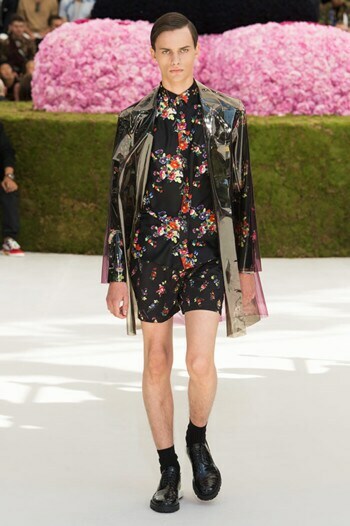 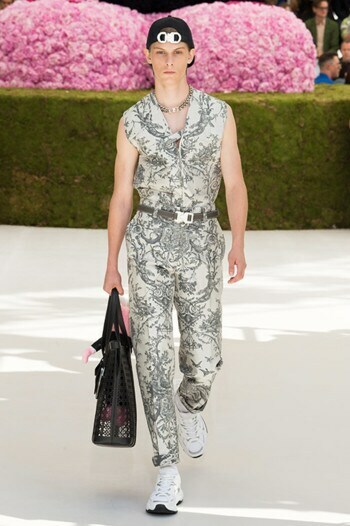 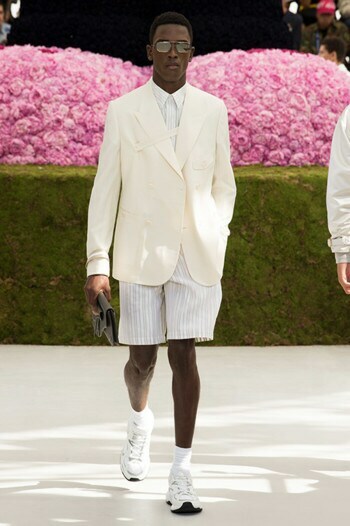 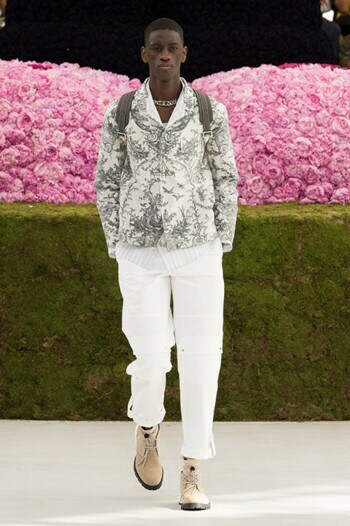 In order to realize his vision of contemporary masculinity, Kim Jones seamlessly fuses tradition with modernity and haute couture with sportswear. 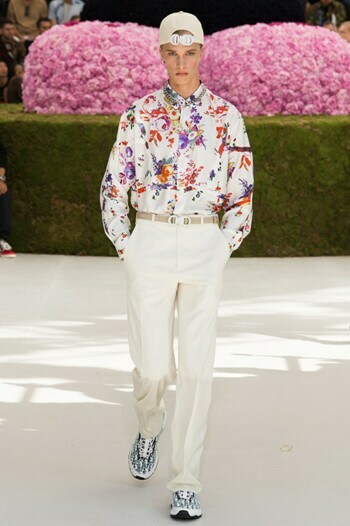 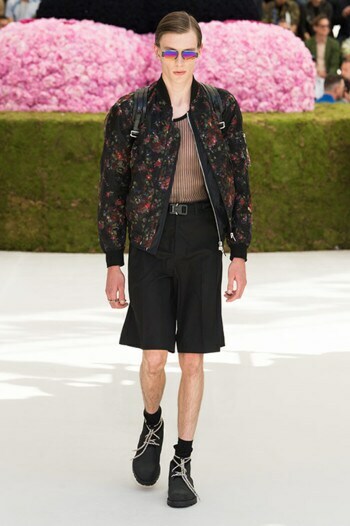 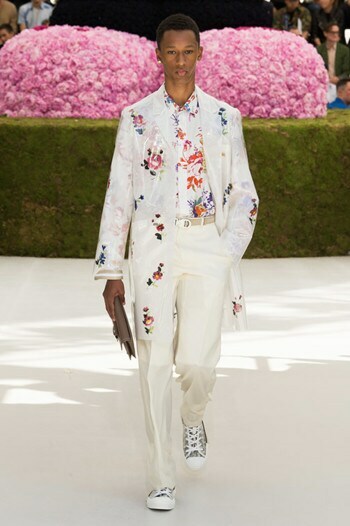 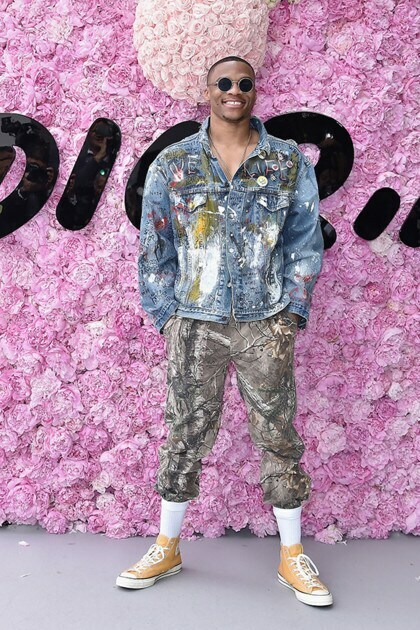 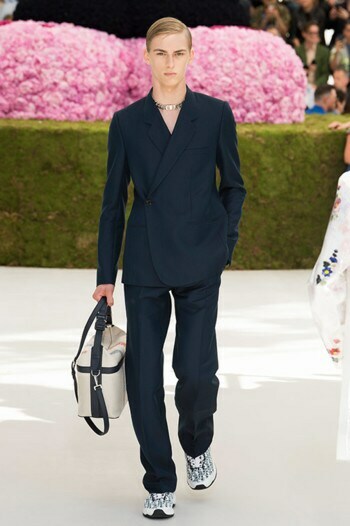 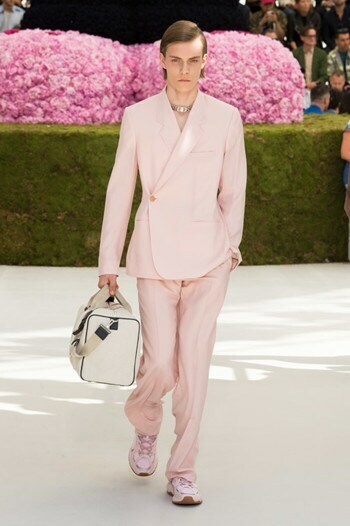 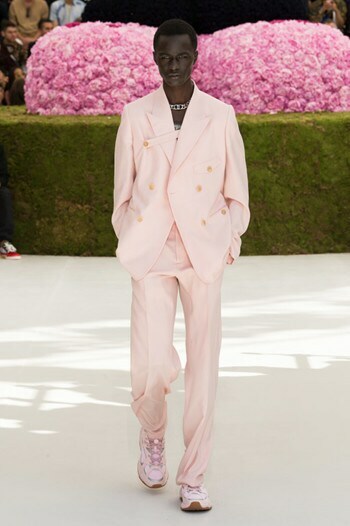 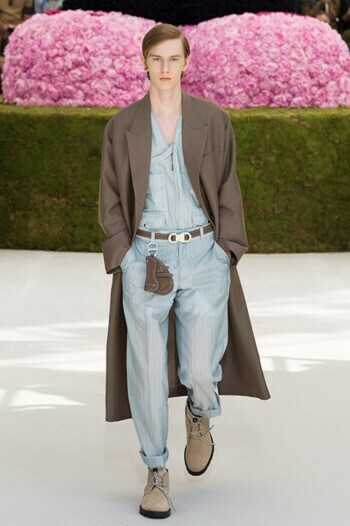 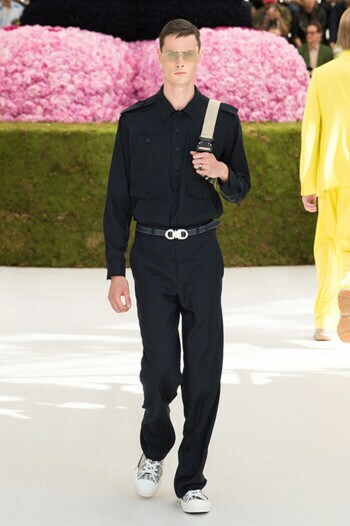 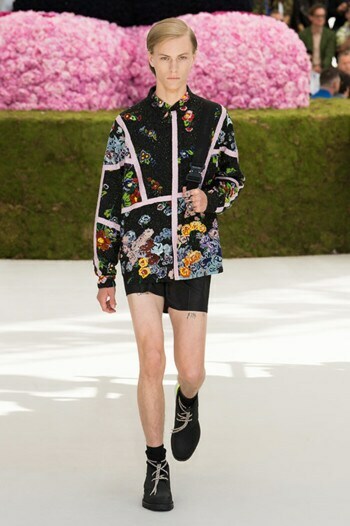 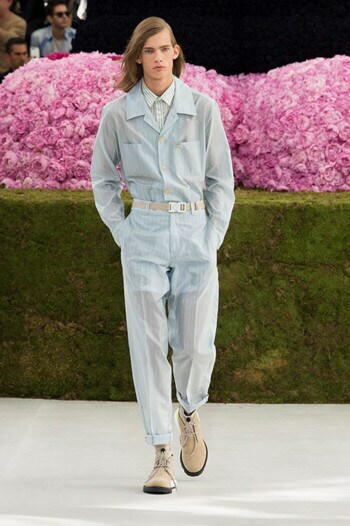 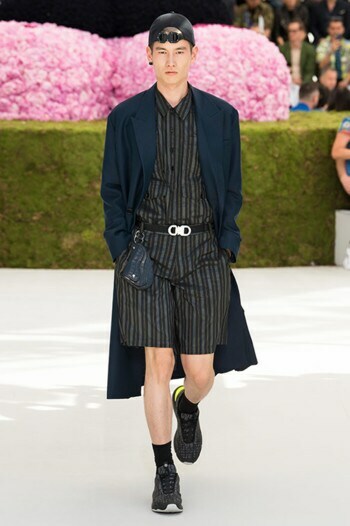 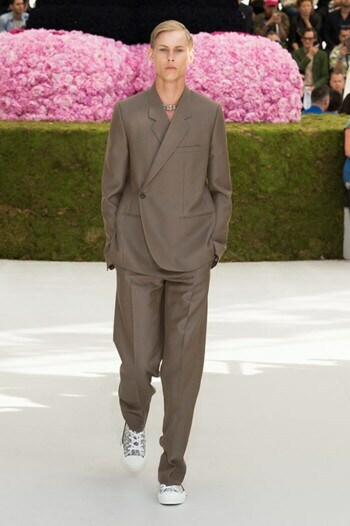 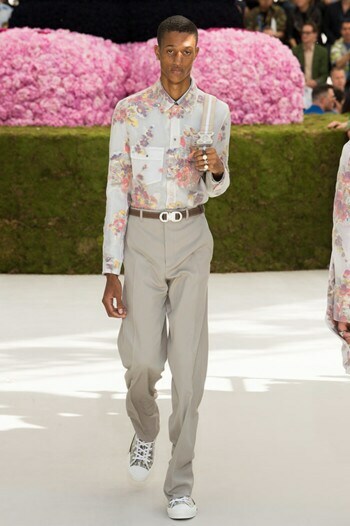 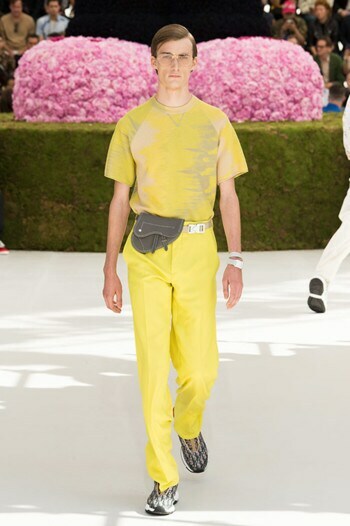 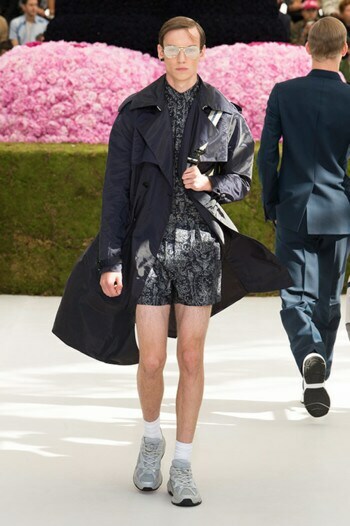 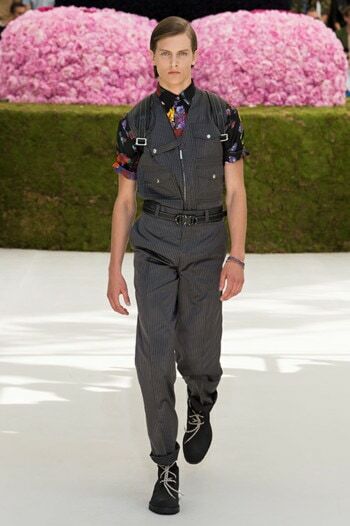 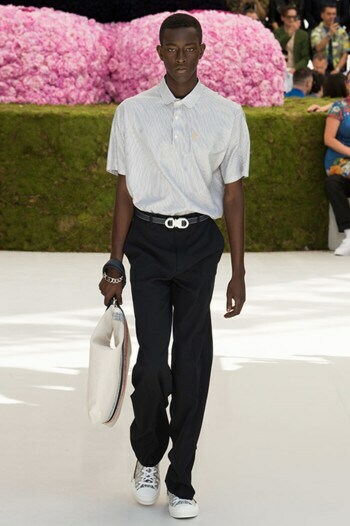 The Spring/Summer 2019 collection also references the profoundly personal and almost secret history of Monsieur Dior. 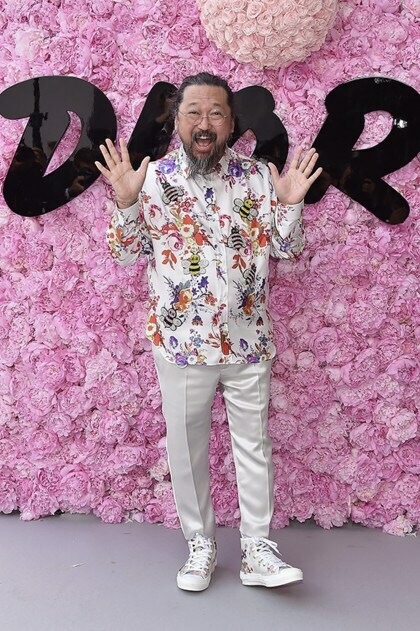 His dog Bobby—who inspired a limited-edition Miss Dior perfume bottle and the name for a suit in the Fall/Winter 1948 collection—is a recurring motif. 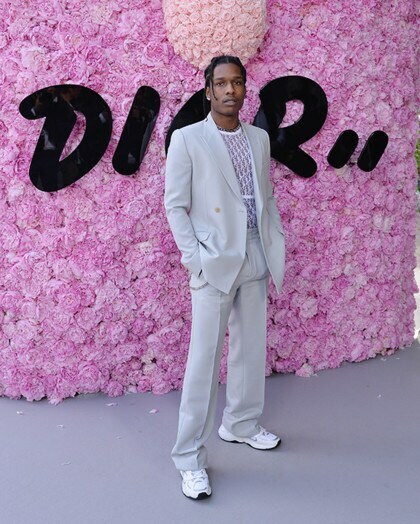 The jewelry introduces a new logo derived from the one used for the Dior family’s business ventures in the 1920s, while an embroidered cipher comes from Christian Dior’s birth announcement in 1905. 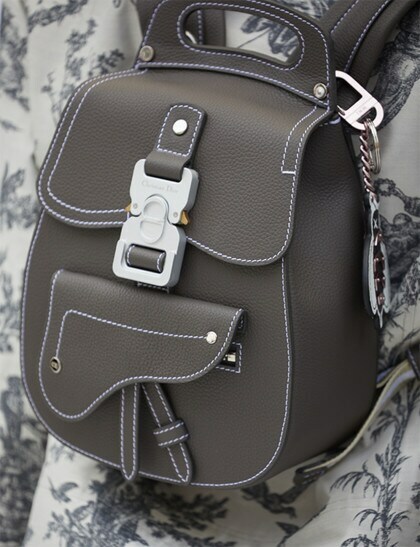 Accessories also draw on the inimitable Dior heritage. 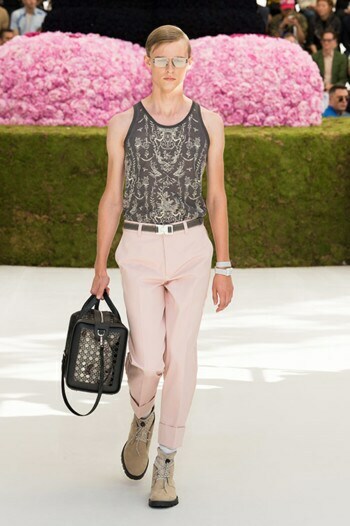 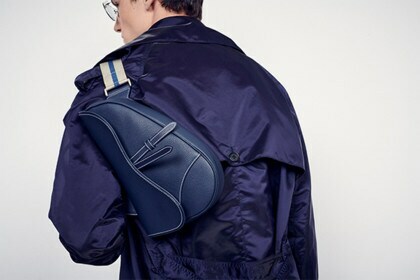 The Dior Saddle bag is interpreted for the first time for men and offered in cross-body, backpack, and belt-bag styles. 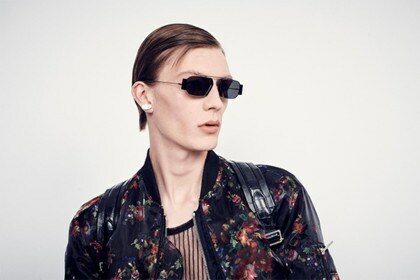 Iconic Dior signatures, such as the cannage pattern, are laser cut into leather, while the recognizable Dior Oblique canvas is now available in a new tricolor variation. 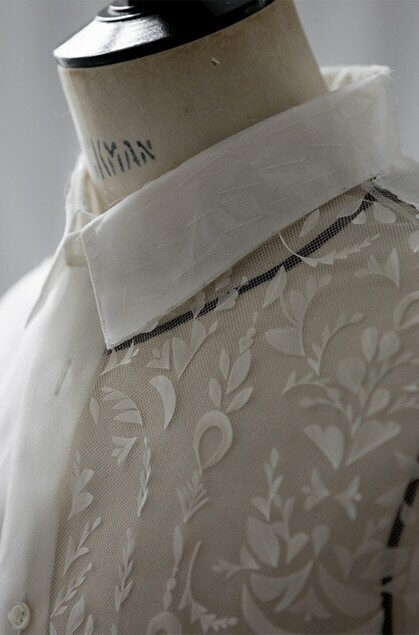 Christian Dior stated that his identity as a couturier was actually not one man but many. 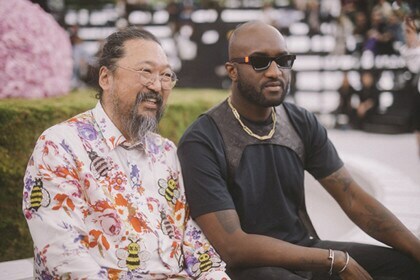 Kim Jones draws on this sense of community for his debut. 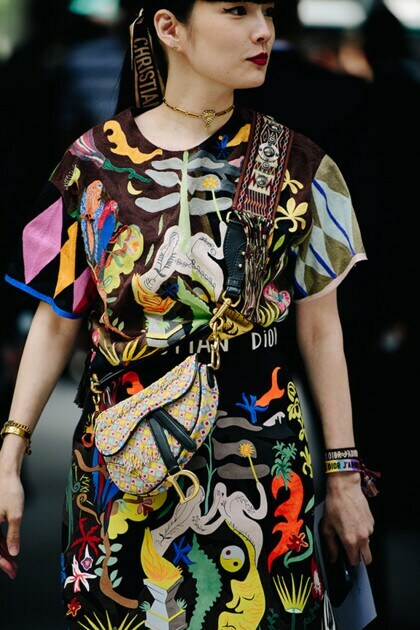 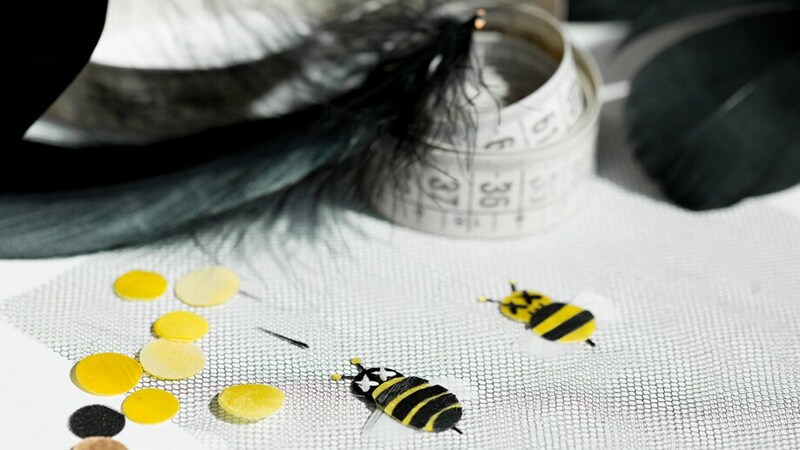 Yoon Ahn of Ambush created the jewelry, employing Dior symbols such as the neoclassical CD, flowers, and insects. 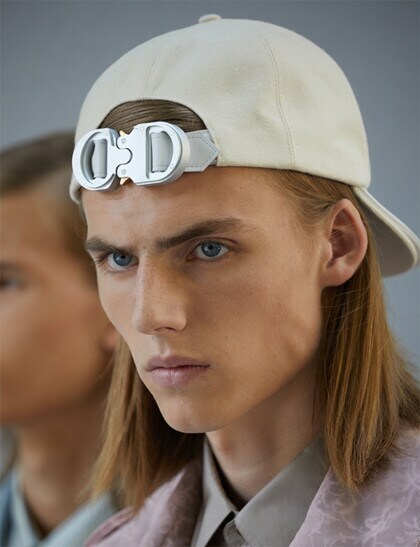 Matthew Williams of 1017 ALYX 9SM designed a new metal buckle spotlighted on belts, bags, and hats. 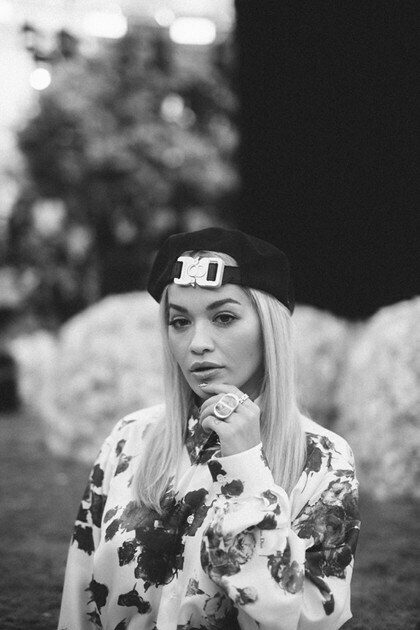 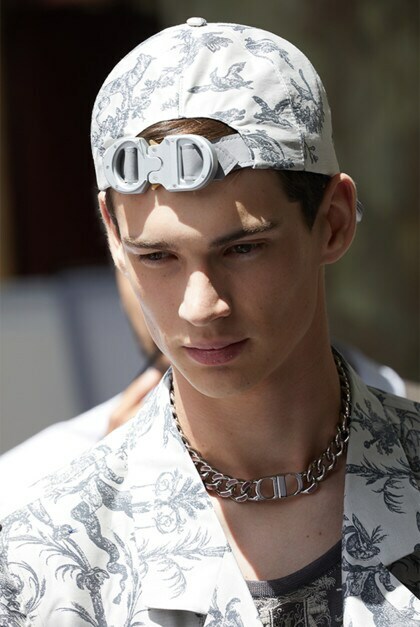 Stephen Jones created millinery based on original Christian Dior Monsieur pieces found in the archives. 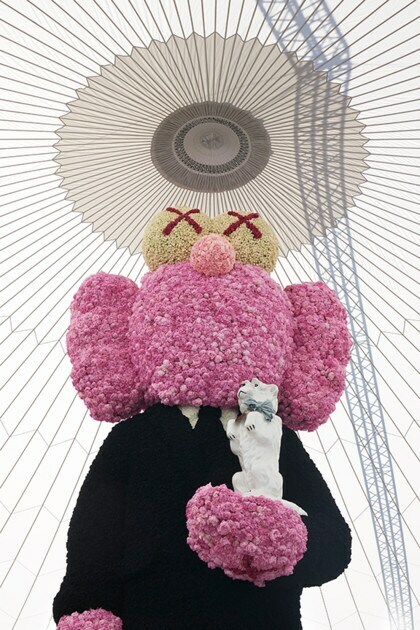 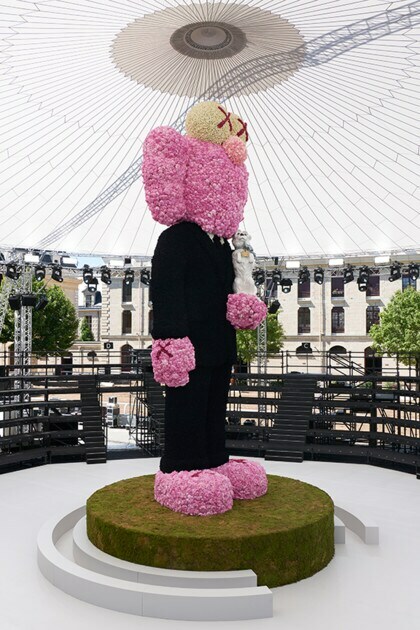 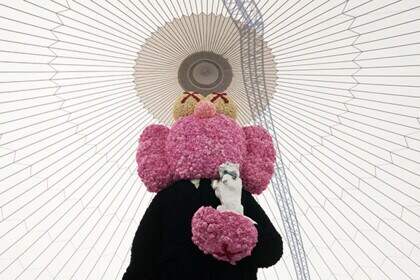 American artist KAWS was commissioned by the house to create a show-stopping sculpture covered entirely in roses. 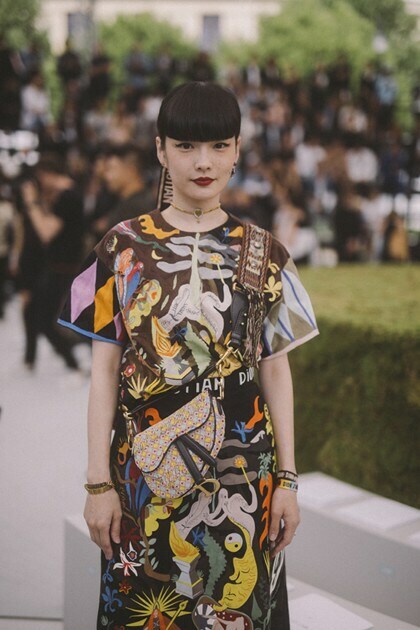 Clutching a replica of the Bobby perfume bottle, the towering piece stood front and center on the runway and was meant to serve as an avatar for Christian Dior himself. 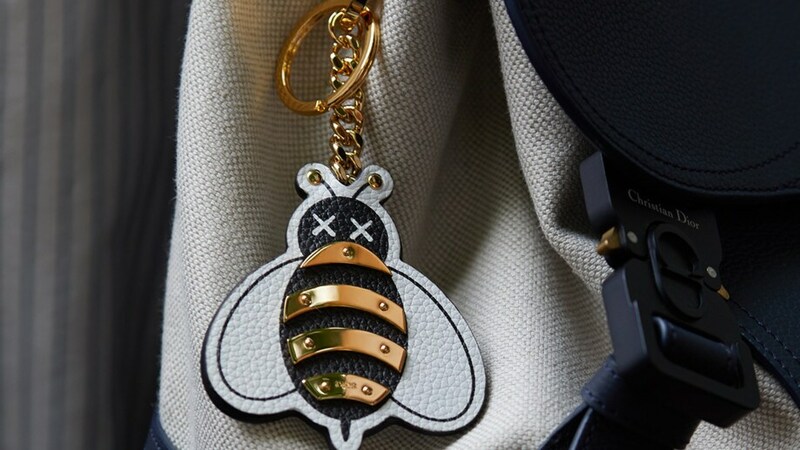 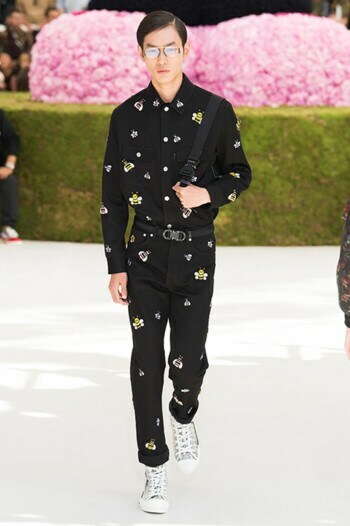 KAWS also reimagined Dior’s classic bee—a design element that appears throughout the collection in the form of intricate embroideries and leather keychains. 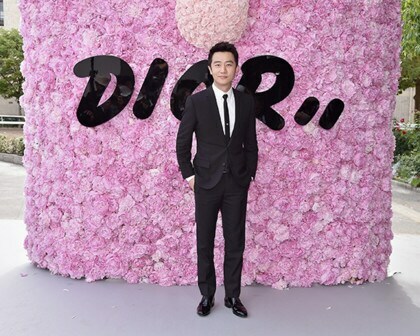 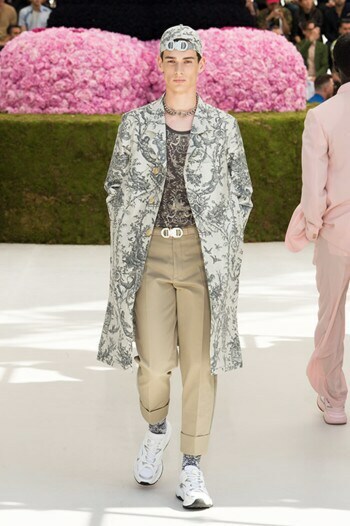 By fusing meaningful collaborations with memories of the past, Kim Jones not only creates a new look for Dior Men, but an entirely new outlook. 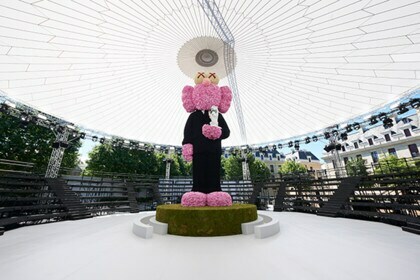 Explore the striking set of the Spring/Summer 2019 runway show held at the Republican Guard in Paris, including a sky-high statue created by American artist KAWS. 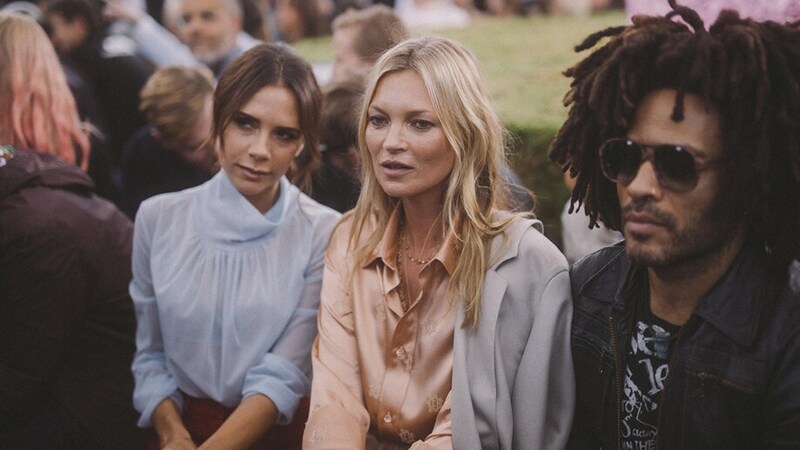 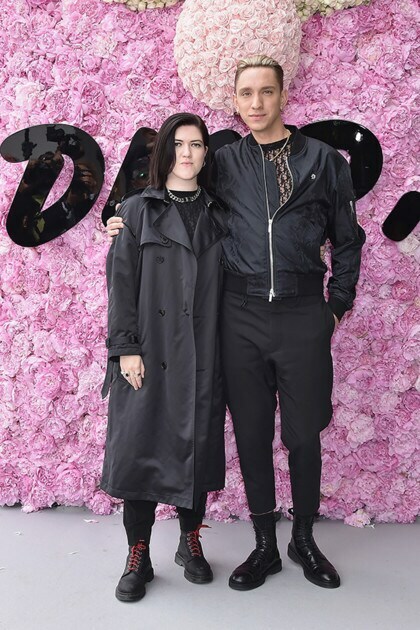 See all the stars who celebrated Kim Jones’ debut for Dior, from A$AP Rocky to Kate Moss. 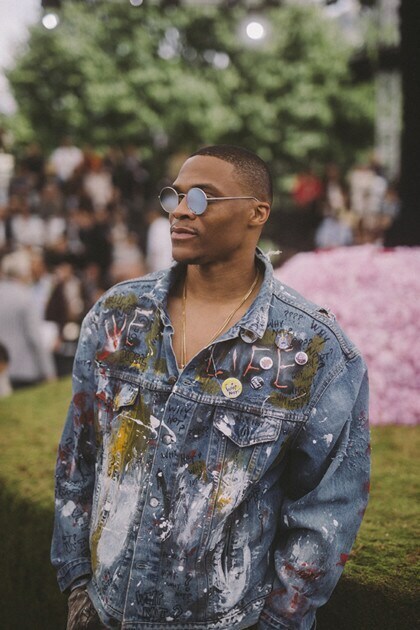 Sit alongside A-listers and friends of the house, including Bella Hadid, Victoria Beckham, Rita Ora, and Russell Westbrook. 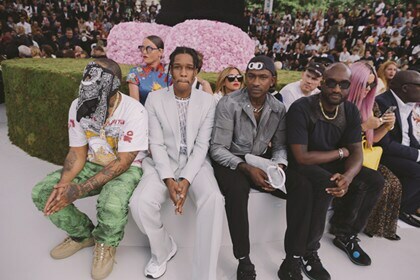 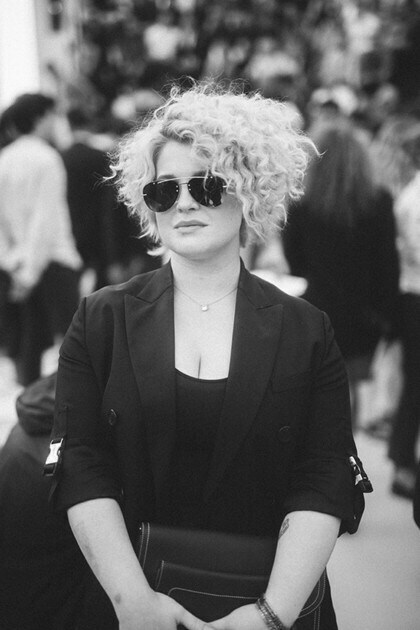 Don’t miss a moment of the action on and off the runway. 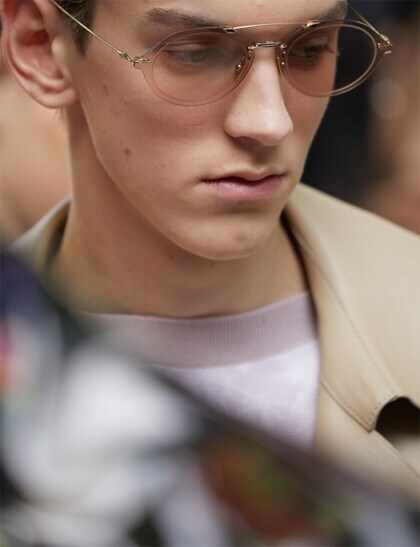 Get up close and personal with detail shots from Dior Men. 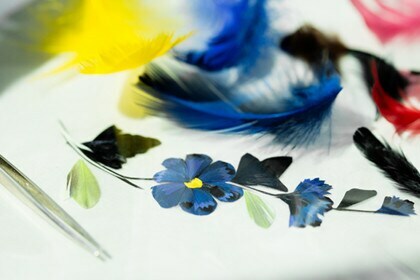 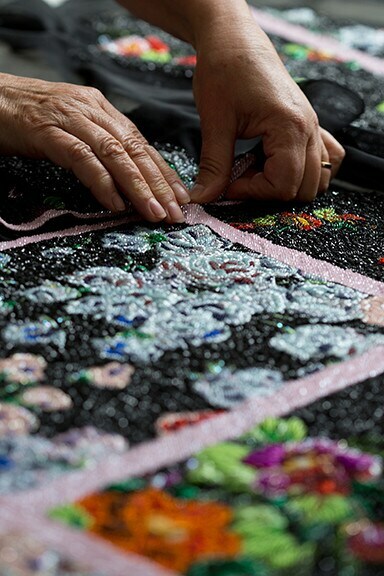 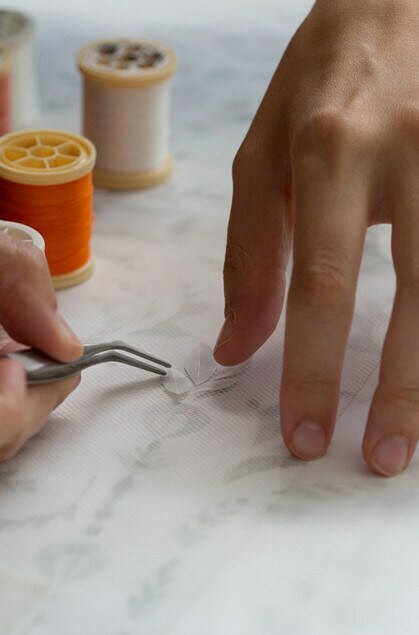 Go behind the scenes at Dior’s haute couture ateliers and watch the collection come to life. 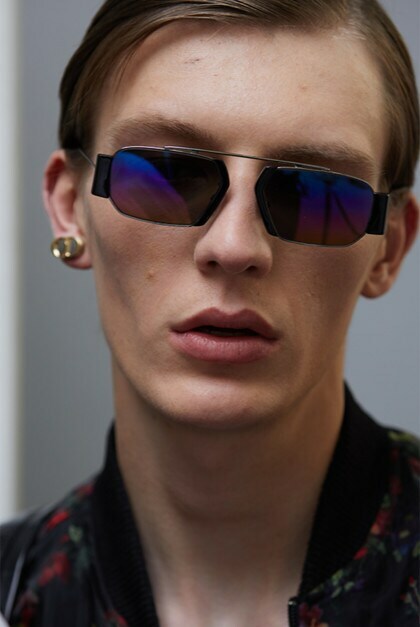 Discover the clothes and accessories before they hit the catwalk. 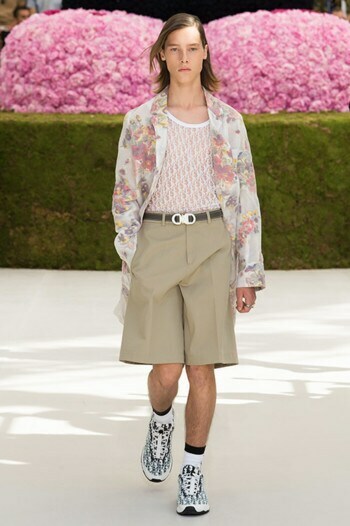 Find out how the designer pulled together the Spring/Summer 2019 collection in just two months.